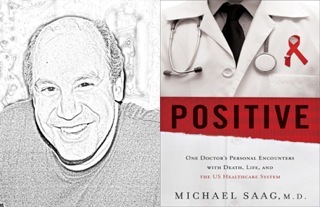 Mark your calendars for May 19th, Tuesday, 7:00 to 8:30 p.m. at B’nai Emunah, 3595 Taraval St., San Francisco, for an informative and provocative presentation about his book, Positive: One Doctor’s Personal Encounter with Death, Life and the U.S. Healthcare System, by Michael Saag, MD. Dr. Saag, University of Alabama at Birmingham professor of medicine, director of the UAB Center for AIDS Research, and internationally-known expert on HIV. Too bad this conflicts with the final session of Rabbi Katie’s series. Yes I agree but we had no choice — he gave us this date. Perhaps you can attend 1/2 of both!